The primary objective of this program is to stimulate members of Scouts BSA, Sea Scout, and Venturing units interest in the ideals of the movement and to promote activity that will result in personal fitness, self-reliance, knowledge of wood lore, and a practical understanding of conservation. Adult leaders 21 or older must make the entire trip. 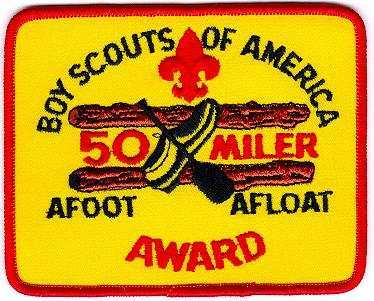 According to the camping and conservation service, horse is (and "has always been") an acceptable mode of travel for the fifty-miler award. There's a note in the publishing files for the award application and requirements book - so that "on horse" and "on bicycle" will be specifically included in descriptions of the fifty-miler requirements in the future. Even without that clarification, since requirement 2 says "without the use of motors", there is nothing in the use of horses or bicycles that contradicts that requirement. Make complete and satisfactory plans for the trip, including the possibilities of advancement, conservation, leadership, and service. 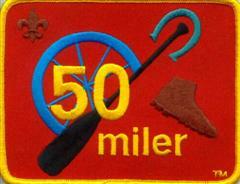 Unit or tour leader must then file a the 50-Miler Award application with the local council service center. This application gives additional details about planning the trip.